Greenhouses, of course, not a fad or fashion, and suffered many a necessity. After all, these buildings, covering a plot of land of glass or plastic, allow * not only early to plant the seedlings in the ground, but also (no less importantly) to protect emerging plants from acid rain or any kind of “evil herbivore”. Special demand from the population use collapsible greenhouses. However, produced by the domestic industry options mostly far from perfect, inconvenient and usually prohibitively expensive. Here and master gardeners-gardeners in their plots all sorts of designs from scrap materials where lead foil, a nail, a Board homegrown clip. Construction work flimsy, “perniciously” not withstand even one season of operation. But… Every spring the people with the tenacity of a tight dried-up film (the other being at hand at that time somehow is not) skeletons of their teplichku-greenhouses. About arch (although “polyethylene double-layered”) structure, a sketch of which is given below, bad reviews no. Operation of several greenhouses for three seasons confirms adequate strength, good wind resistance and economy, which greatly promoted and successfully found the streamlined shape of the frame, and “bezvodivka” mounting method of the film, and reducing heat loss two-layer cladding. The basis of the greenhouse I have steel arches, assembled into a “sandwich” of strips (the material for which was trimming 20 mm boards, remaining after the construction of cottages), and three bars. The result is a cheap, simple and yet durable construction. 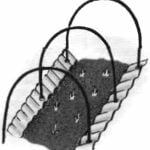 All connections are made with screws — in the case of repairs it is easy to replace one or the other element, and if necessary to dismantle the greenhouse. For those who have decided to make myself a similar design, I recommend you to start with billet straps based 42 on one arch. The rails and the outer layers you need to drill the hole equal to the diameter of the screws. This will simplify installation and prevent the workpiece from cracking. The Assembly of each of the arches should be done on a level floor. With a cord there is drawn an arc of the desired radius, inside of which wedge first (external) line type layer. On it laid, like bricks in the construction of the Foundation, the second (inner) shifted along the circumference by half the length of the strap and a temporary “healing” several nails to the floor. Last comes the third (outer) layer. Styling is similar — with a shift. 1 — arch; 2 – beam ridge; 3 Klondike solitaire (4 PCs); 4 — window; 5 — spacer (2 PCs); 6 — longitudinal beam (2); 7 — cosina (4 PCs); 8 — door; . 9 — base covering. The distance between the arches and, accordingly, the length of the entire structure depend on the size of a two-layer roll film . 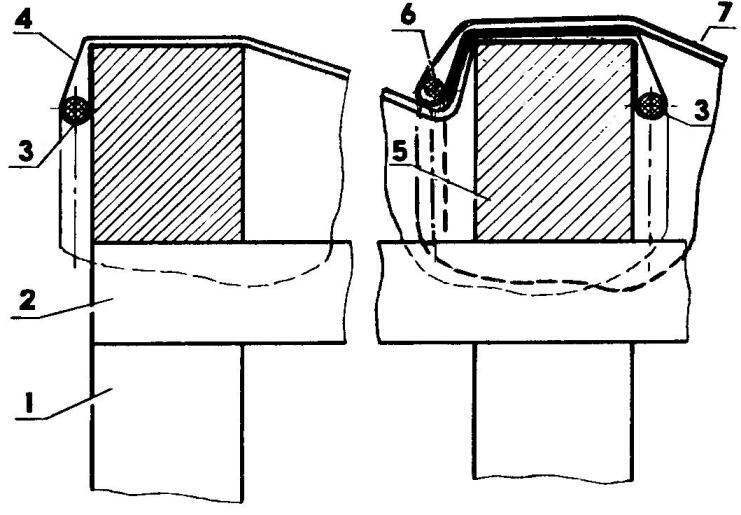 1 — soil; 2 — a mini Foundation of concrete blocks; 3 — waterproofing; 4, arch; 5 bar pressure; 6 — nail; 7 — base covering hardwood; 8 — skirt moisture barrier (rolled plastic sheeting); 9 — screw; 10 — powder dirt. Strap (a) and collect on the screws of 42 such elements arch (b). 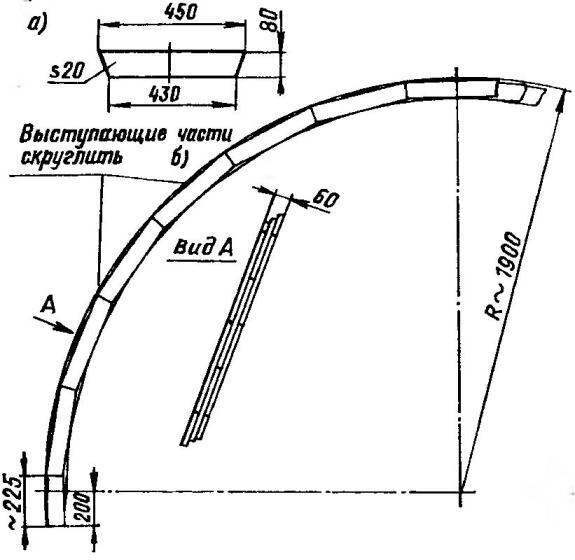 1 arch No. 1 (front); 2 — timber ridge; 3 — the first couple of ties (cord linen, 2 PCs. ); 4 — “stocking” film No. 1; 5 — arch No. 2; 6 — cable ties (cord clothesline, 2); 7 — “stocking” film No. 2; the arches are conventionally depicted as solid construction. The resulting three-layer “sandwich” thoroughly “stitch” screws: first with one and then with the other hand. Manually to do this, of course, exhausting. Can be recommended screwdriver attachment for electric drill, the application of which facilitates and accelerates the Assembly not only of arches but also of the entire greenhouse as a whole. Protruding parts of the strips at the joints stesyvajut an axe with the subsequent processing of a rasp to eliminate sharp edges and give the arch a smooth curvature. 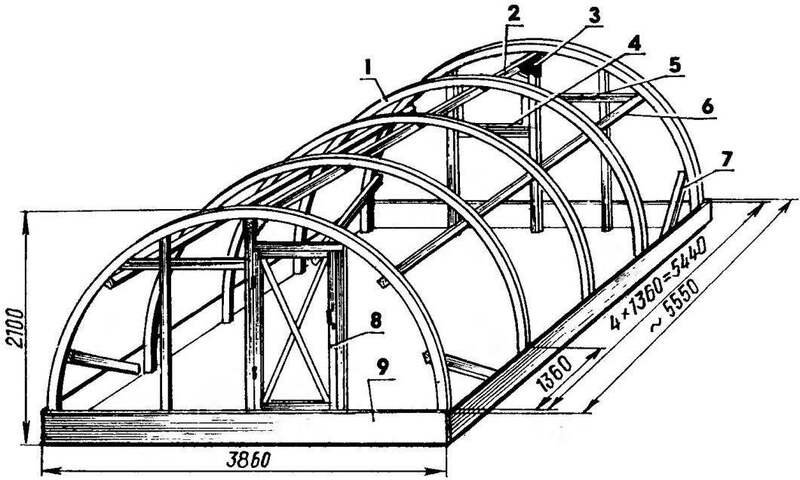 The number of manufactured arches depends on how long you are going to build a greenhouse. 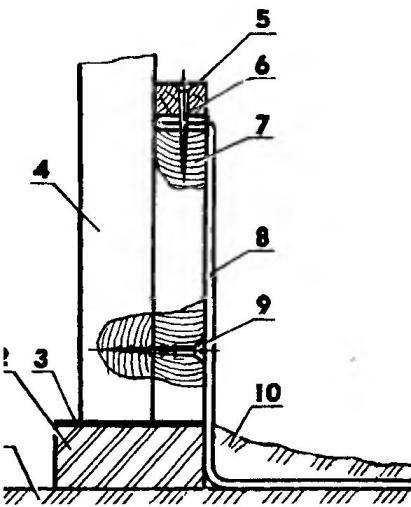 Bearing elements of the structure are also two lateral longitudinal beam and the Central called ridge run. Material for them is pine timber 40×40 mm. 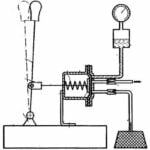 But you can use a one piece pole, giving it a possible square cross-section. And the shuttering will go unedged, Croaker or any other timber with width up to 300 mm and a thickness of 20-30 mm. And in all, ranging from the run and ending with the last Board sheathing, drill (pitch 1360 mm, if double layer polyethylene greenhouse film a four-foot width) openings for screws 8×70 mm. Window and door lightweight. You can (and as shown, in Siberia — even advisable) instead of window to install the second door. To extend the service life of the greenhouse all the wooden parts of the structure covered with two layers of red lead or natural varnish. Installation of greenhouses on the allocated plot start connecting ridge run with arches. To the resulting frame through equal intervals is screwed from the inside of the longitudinal side beams and at the base of the arches are fixed low trim. Then install the center pillar. To konkovomu to a bar they are fixed at a right angle with the plywood gusset thickness of 10-12 mm, and the bottom screw screws directly to the sheathing boards. To make the ends of the frame more rigidity to the extreme of the arc increase by additional struts and braces. The direct contact of a wooden frame with a ground rule, placing the ends of the arches and pillars treated with tar bricks — sort of mini-Foundation with a waterproofing layer. And to prevent shifting of the greenhouse (eg, hurricane) on the inner side of the sheathing (in the corners) pierce pitched oak or pine stakes. Material for waterproof skirt that covers the gap between the siding and the soil is thick vinyl. But go and thin plastic, which for greater strength and durability pre-roll in several layers. If any, that is, the alignment skirt attached to the upper edge of trim panel with retaining plate and nails, and the bottom simply sprinkle the ground and rolled down. The ends of the greenhouse, the window and door fit durable reinforced (do not remove for the winter!) film. Nail it to the timber-based again, not directly, but through the rail with a thickness of 3-4 mm. At the same time it should not strive to achieve here drum tautness. After all, the best is the cording, made a barely noticeable sagging, or the film, being reduced in the cold, losing its former elasticity, might burst. The decoration of the arch greenhouses double-layer film secrets. Length cut from a roll of blanks should be 20-30 mm shorter than the arc. The ends of each “stocking” is recommended to paste over 3-4 layers of Scotch. This will help to protect the canvas of the film from the gap when tight. Inside each “stocking” is necessary to pass a pair of durable cords (such as nylon underwear) that then throwing them drop outspread on the workpiece through the frame of the arch, to tie all this to the thick nails-hooks, hammered on the outer side in the wood paneling of the greenhouse. Uniform tension of each of the resulting two-layer ribbons are seeking in a sequence that is easy to understand from the above schemes, where the arches are depicted as continuous structures. 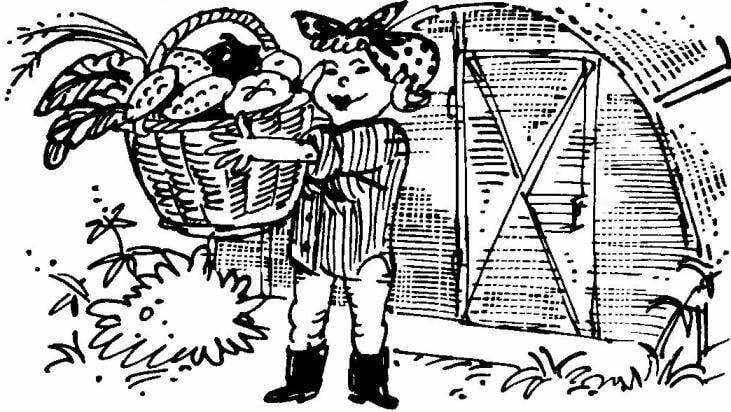 At the end of the summer season film vault with greenhouses clean, untie the cords of the nails-hooks and roll up a double layer of tape-the”stockings” into rolls for storage until next spring.